Got kunig oberster Got er wont im himel, et ist stark im himel, sterk seines gewalt sie wert derhecht. Ewig un' aumer er wert kunigen. Wen as dein namen Got aso ist dein lob, du bist hert zu derzornen un' du bist senft zu wiligen un' nit du begerst an zu töten der da ist schuldig zu töten um sein sund wenn neuert das er wider kert von seinen tods, du wartest zu ihm ob er wider kert un' tut zu hant du onpfangst ihn, wen du Got du bist ir beschefer un' drum du weist un' kenst wol ir gedeknis, wen sie sein vleisch un' blut. Wol dem man der nit in der rat get, un' in weg der sünder nit er stet, in gesess der speter nit er sizt, neiert auf recht der gibt er sein sin ue' wiz. Die recht der halt er in groser acht, da inen lernt er tag un' nacht, der selbig wert sein as ein baum der vun wasser nit stet weit, welcher sein ops gibt in seiner zeit. Es is ein zeit zum schweigen, es is auch ein zeit zum reden. ale ding hot seine zeit, schweigen iz wol gut, reden vil besser wen es not thut; es is nit ale mol wol getan wen man schweigt, den wen dich einer an deiner eren un' antast, heisst dich ein oder der gleichen, un' du woltest derzu schweigen, so thustu nit wol dran. der Vater von that verkauft . Un' is ein mal derbei gestanden, un' wenn einer is gekommen un' hat gewolt kaufen da fragt Wie alt bistu? Da entfert er fufzig oder sechzig jar, da sagt er wieder: du bist nun alt sechzig jar un' du wilst dich bucken zu einem das da ein tag alt ist? Da hat sich der selbiger geschemt un' is weg gegangen. Kumt her libe manen un' frauen, un' tut das schen anschauen, mit drei hundert und etliche die da seinen ale aus die gemacht, un' ach aus den un' gemacht. 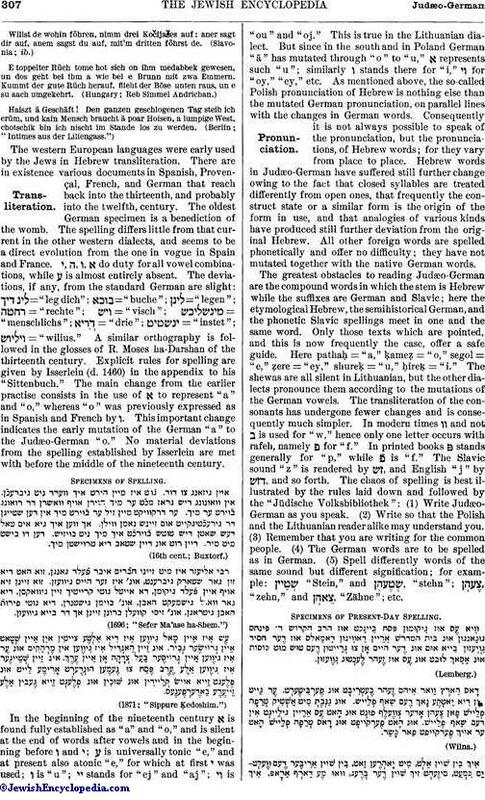 The western European languages were early used by the Jews in Hebrew transliteration. There are in existence various documents in Spanish, Provençal, French, and German that reach back into the thirteenth, and probably into the twelfth, century. The oldest German specimen is a benediction of the womb. The spelling differs little from that current in the other western dialects, and seems to be a direct evolution from the one in vogue in Spain and France. י, ה, ו, א do duty for all vowel combinations, while ע is almost entirely absent. The deviations, if any, from the standard German are slight: ="leg dich"; ="buche"; ="legen"; ="rechte"; ="visch"; = "menschlichs"; ="drie"; ="instet"; ="wilius." A similar orthography is followed in the glosses of R. Moses ha-Darshan of the thirteenth century. Explicit rules for spelling are given by Isserlein (d. 1460) in the appendix to his "Sittenbuch." The main change from the earlier practise consists in the use of א to represent "a" and "o," whereas "o" was previously expressed as in Spanish and French by ו. This important change indicates the early mutation of the German "a" to the Judæo-German "o." No material deviations from the spelling established by Isserlein are met with before the middle of the nineteenth century. Specimens of Spelling. (16th cent. ; Buxtorf.) (1696; "Sefer Ma'ase ha-Shem.") (1871; "Sippure Ḳedoshim.")Pronunciation. 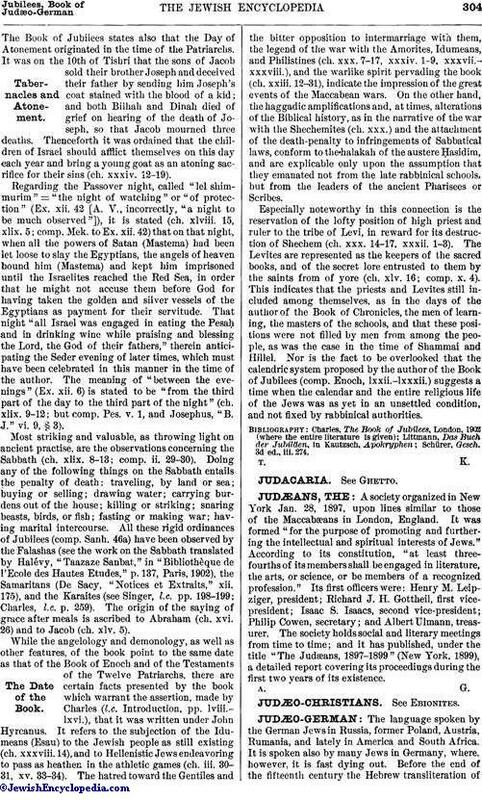 In the beginning of the nineteenth century א is found fully established as "a" and "o," and is silent at the end of words after vowels and in the beginning before ו and י; ע is universally tonic "e," and at present also atonic "e," for which at first י was used; ו is "u"; stands for "ej" and "aj"; is "ou" and "oj." This is true in the Lithuanian dialect. But since in the south and in Poland German "ā" has mutated through "o" to "u," א represents such "u"; similarly ו stands there for "i," for "oy," "ey," etc. 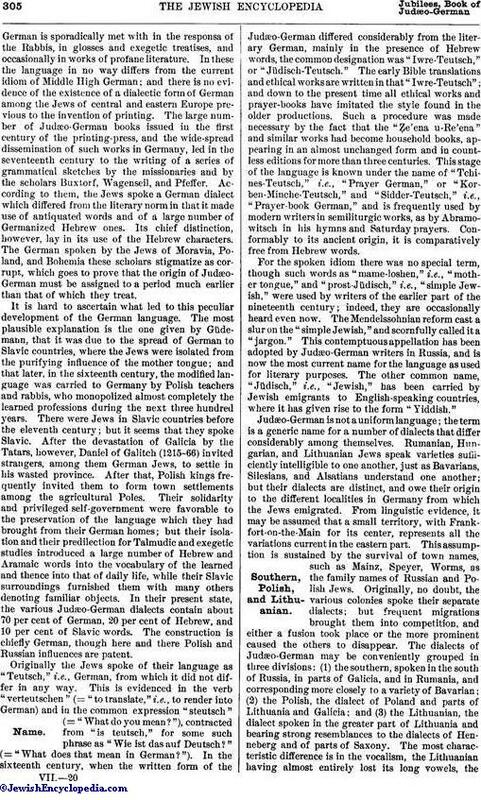 As mentioned above, the so-called Polish pronunciation of Hebrew is nothing else than the mutated German pronunciation, on parallel lines with the changes in German words. Consequently it is not always possible to speak of the pronunciation, but the pronunciations, of Hebrew words; for they vary from place to place. 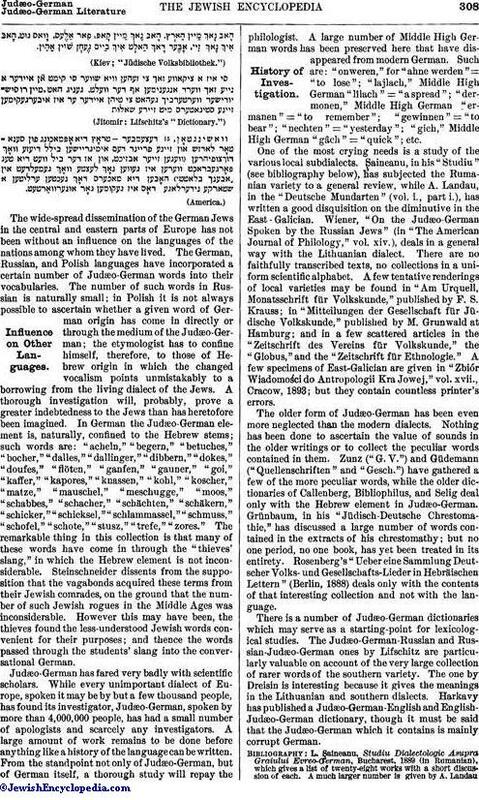 Hebrew words in Judæo-German have suffered still further change owing to the fact that closed syllables are treated differently from open ones, that frequently the construct state or a similar form is the origin of the form in use, and that analogies of various kinds have produced still further deviation from the original Hebrew. All other foreign words are spelled phonetically and offer no difficulty; they have not mutated together with the native German words. 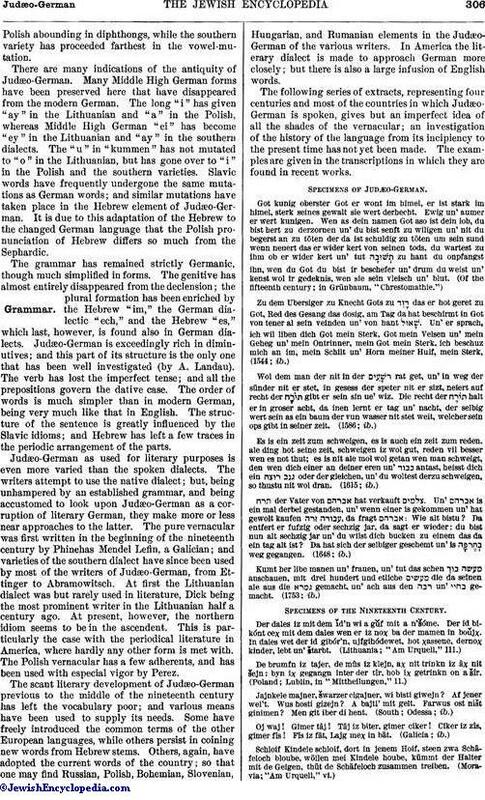 The greatest obstacles to reading Judæo-German are the compound words in which the stem is Hebrew while the suffixes are German and Slavic; here the etymological Hebrew, the semihistorical German, and the phonetic Slavic spellings meet in one and the same word. Only those texts which are pointed, and this is now frequently the case, offer a safe guide. Here pathaḥ = "a," ḳameẓ = "o," segol = "e," ẓere = "ey," shureḳ = "u," ḥireḳ = "i." The shewas are all silent in Lithuanian, but the other dialects pronounce them according to the mutations of the German vowels. The transliteration of the consonants has undergone fewer changes and is consequently much simpler. 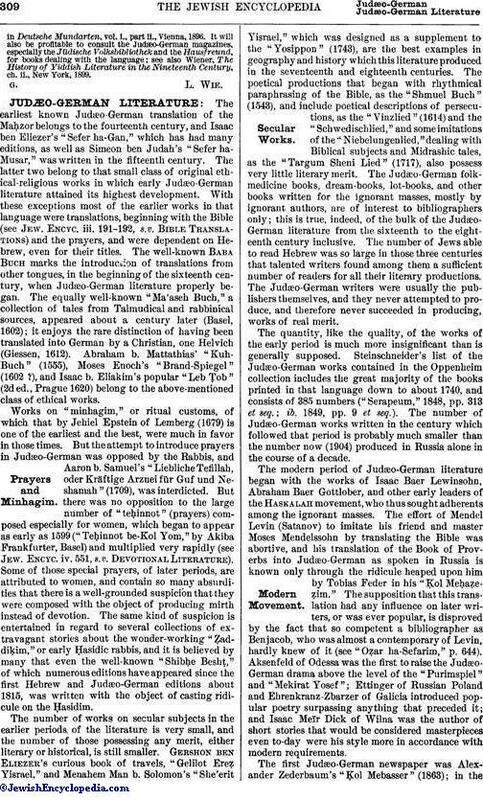 In modern times and not ב is used for "w," hence only one letter occurs with rafeh, namely פ for "f." In printed books פּ stands generally for "p," while is "f." The Slavic sound "z" is rendered by , and English "j" by , and so forth. The chaos of spelling is best illustrated by the rules laid down and followed by the "Jüdische Volksbibliothek": (1) Write Judæo-German as you speak. (2) Write so that the Polish and the Lithuanian reader alike may understand you. (3) Remember that you are writing for the common people. (4) The German words are to be spelled as in German. (5) Spell differently words of the same sound but different signification; for example: "Stein," and , "stehn"; "zehn," and , "Zähne"; etc. Specimens of Present-Day Spelling. (Lemberg.) (Wilna.) (Kiev; "Jüdische Volksbibliothek.") (Jitomir; Lifschitz's "Dictionary.") (America. )Influence on Other Languages.